After three nights of violence in London and several other cities, which left authorities stunned and the people hunkered down, questions about the way Britain is handling its ethnic minorities have again come to fore. With nearly 5 million non-Whites , that is, about 8% of the population, the image of multiculturism has taken a severe beating as the current round of proteststurning-into-general criminal violence plays itself out. Many are calling this the worst ever, arguably, even more severe than riots that engulfed Britain in the early 1980's when Margaret Thatcher was in power and the economy was being rebooted. 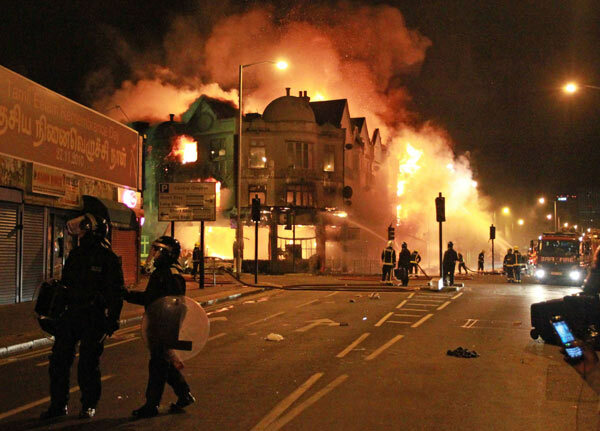 In 1981, violence had first exploded in Brixton and later spread to several other cities. In a damning indictment of the racial policy of the government , Lord Scarman's enquiry report said that the violence was "essentially an outburst of anger and resentment by young black people against the police" . Similar findings were presented by a host of reports following riots and violence in subsequent years, especially in 1985 and as recently as the 2001 Oldham riots. Fifteen years of rule by New Labor, elected in reaction to the conservative policies of Thatcher appear to have left the inequalities untouched. In 2009, the Equality and Human Rights Commission released a report called 'How Fair Is Britain'. Speaking of the poor and ethnic minorities, Trevor Phillips, its chairman said, "Gateways to opportunity that appear permanently closed, no matter how hard they try; while others seem to have been issued with an 'access all areas' pass at birth" . People of Asian origin, mainly Indians, Pakistanis and Bangladeshis comprise about half, while Blacks make up a quarter, of the ethnic minorities in Britain. Unemployment rates among Black Caribbean, Black African, Bangladeshi and Mixed ethnic groups (between 13 and 14 %) were around three times the rates for White British (5 %), according to an Office of National Statistics study of 2004. According to UK's Department of Works and Pensions study, two fifths of the ethnic minorities live in low-income households, defined as 60% or less than the median British income. This is twice the rate for White households. Among families with at least one member working, around 65% of Bangladeshis, 50% of Pakistanis and 30% of Black Africans are in low-income households, much higher than the 10-20 % for Whites, Indians and Black Caribbeans. Criminality has become endemic among poorer communities - there are seven times more Blacks in British jails than Whites. Cuts in social welfare have meant local councils and police no longer have contact with the people. Protesters are using Blackberry for mobilizing and coordinating . The last recession hit the poor badly in Britain. With another one looming, the fires of discontent are being stoked - Tottenham may just be the beginning.